Science: The complex evolution of multiscale cloud systems illustrates the myriad of weather phenomena that populate our atmosphere. 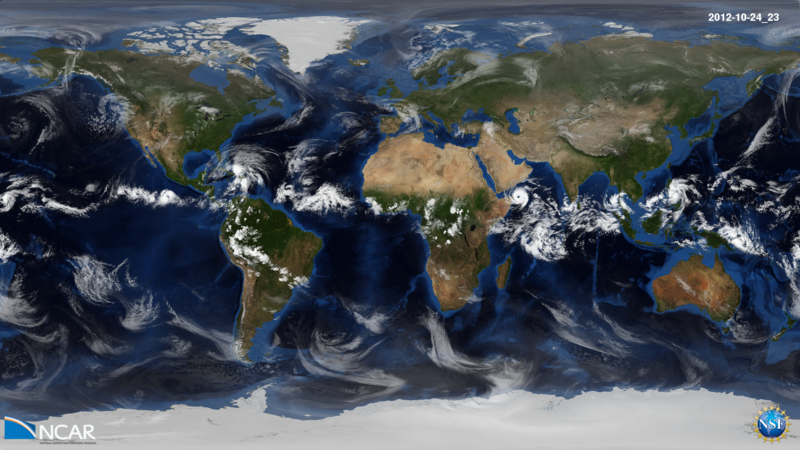 Features of interest include the diurnal cycle of convection over central Africa and the Amazon rain forest; the birth, intensification, and demise of tropical cyclones in the Indian Ocean and Western Pacific; the recurring developments of extratropical cyclones along the midlatitude jet streams; and the formation of orographic clouds downstream of the Rocky Mountains. The simulation was created with the Model for Prediction Across Scales (MPAS), a collaborative project for developing atmosphere, ocean and other earth-system simulation components for use in climate, regional climate and weather studies. The primary development partners are the climate modeling group at Los Alamos National Laboratory (COSIM) and the National Center for Atmospheric Research. For this experiment, MPAS was configured with a horizontal resolution of 4 km and 55 vertical levels. This resolution allows for the explicit simulation of deep convection (i.e., heavy rain showers and thunderstorms), facilitating the seamless prediction of weather from local to planetary scales. The animation time step is 12 min. This research was made possible with an NCAR Strategic Capabilities 3-million core-hour allocation, and facilitated by NCAR’s CISL compute, visualization, and storage resources, including Yellowstone, a 1.5 petaflops high-performance IBM iDataPlex cluster at the NCAR-Wyoming Supercomputer Center in Cheyenne, Wyoming. 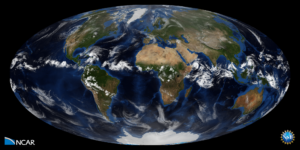 The Model for Prediction Across Scales (MPAS) is a collaborative project for developing atmosphere, ocean and other earth-system simulation components for use in climate, regional climate and weather studies.